"Showing up" has been one of my mantras for 2013. As someone who is mistake-averse, a setback (real or imagined) can just about make me want to turn around and avoid the situation altogether. my job is simply to show up, to whatever happens next. When I do, I find that what happens is often much less scary than imagined. The roadblock I perceived? Not impossible to overcome. Those bad vibes from someone? Not there this time. A day filled with procrastination? Today was different. But I wouldn't have known all that, if I assumed the worst and then lived up to it. By showing up, I choose to respond to reality as it unfolds, not for what I fear it to be. And that allows me to try, to fail, to get embarrassed, to try again, to innovate, and ultimately to keep creating. Is there any area in your life (career, relationship, etc.) where you get stuck in (a) what has happened, or (b) what you fear? 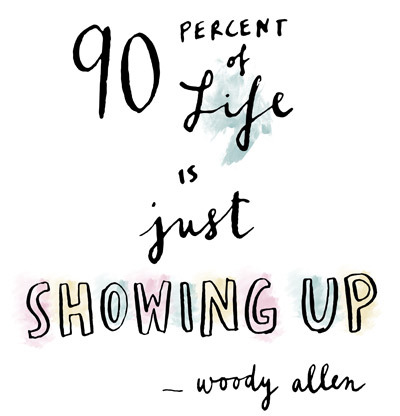 Or are you an expert in "showing up"?